Halloween isn't the biggest thing around here in South Africa. There are a couple of shops that sell some Halloween party decorations and gimmicks, but other than the odd Halloween party here and there, it kinda passes us by without much of a hoohaa. But I do want to wish my American and Canadian blogging friends a Happy Halloween though. 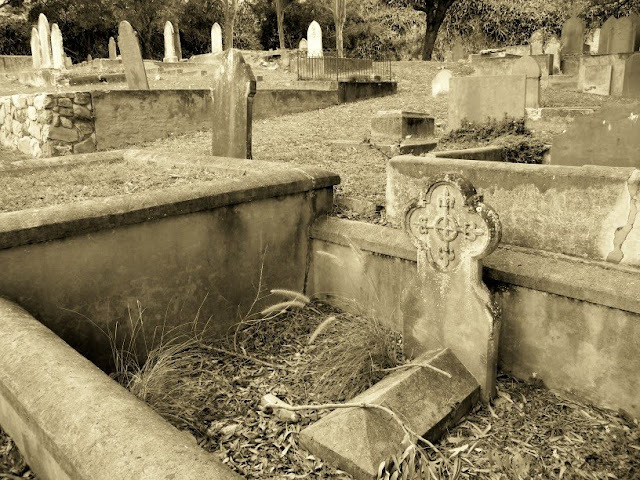 At a loss of anything scarier to post, I'm featuring a picture taken in the historic St Mary's Cemetery. I don't get much chance to play golf. Perhaps twice a year, which means I'm anything but a skilled golf player. I normally play a (half) round with my brother when I get a chance and then just share his clubs as well. What makes my game worse is that although I'm right handed, I hold a cricket bat left handed. This means that I play with right handed clubs and a left handed grip which makes my swing look a bit awkward. Anyway, because my lack of skill and clubs will probably make any main stream golf club make me turn around at the door, we play at either one of two 9 hole golf courses. 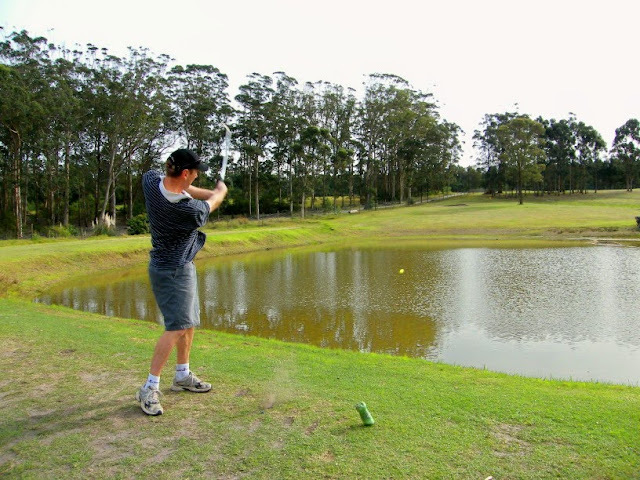 Here my Boet is teeing off on the 6th over the water at the Kragga Kamma Golf Course just outside town. By the way, that little yellow ball of his (seen above the water) went *plonk*. Sunset behind the Duckpond Pavilion at St Georges Park, South Africa's oldest test cricket stadium. St Georges Park is the grounds of the second oldest cricket club in South Africa, the venue for the first Test, the first women's international Test, the last Test before South Africa's expulsion from world cricket, the first ever Test series win against Australia, the first Rebel Test, the first Test with the resumption of 'normal' cricket. . . and the sixth oldest cricket ground in the world. Not bad for a stadium that started out in 1859 on an open tract of veld alongside a cemetery on a hill outside the harbour town of Port Elizabeth. 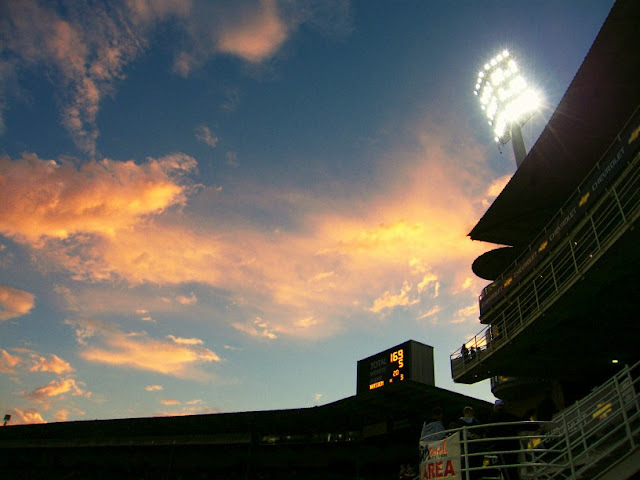 Today, of course, the world-class 18 500-seater stadium, set within the grounds of the beautiful St George's Park, is slap, bang in the middle of the city whose love of the game began with the arrival of the 1820 British settlers. To read up more on the stadium's facinating history, visit St Georges Park's History. For more great pictures of the sky from all over this beautiful world of ours, visit Skywatch. 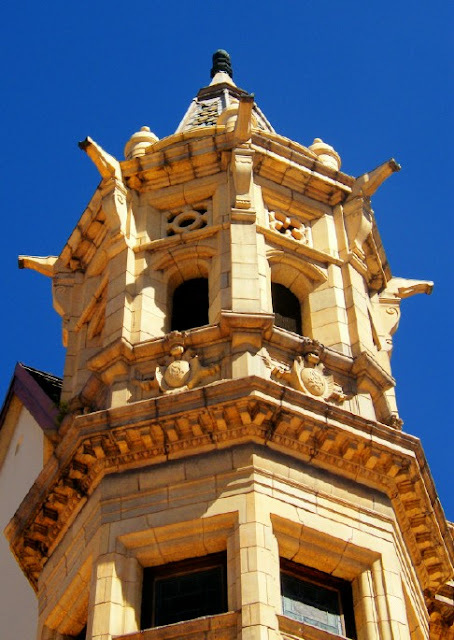 One of the little towers on the historic Main Library in town. 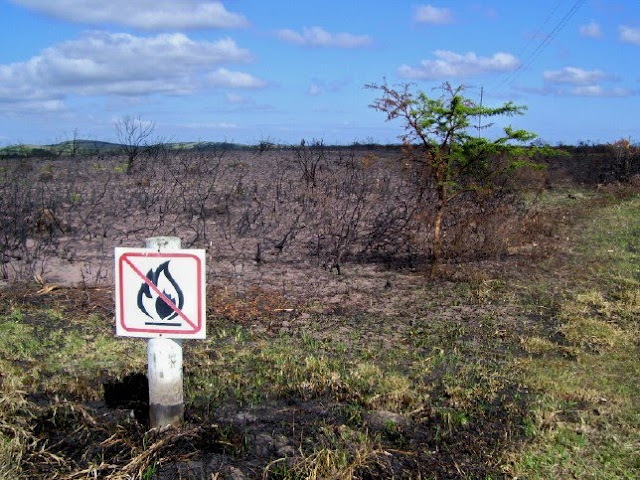 Today's post is a follow up on yesterday's post on the Veld Fire in the Van Stadens Wildflower Reserve. A week or so after the fire I got to go past that way again and popped into the reserve to check out the damage. I found this scene very ironic (and funny). I was going through some older pictures I took some time ago and found this one which I haven't posted before. 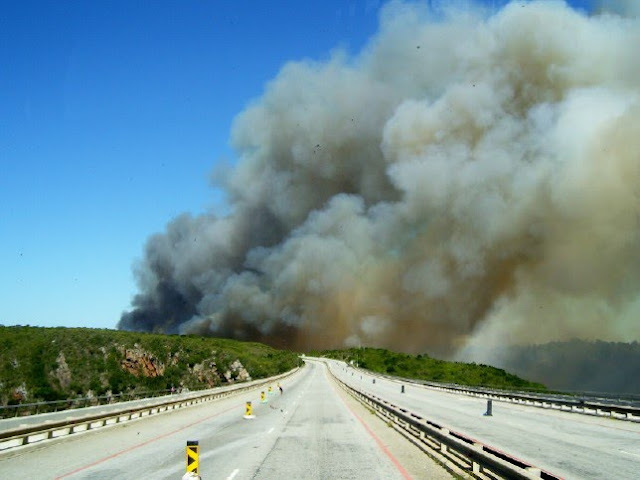 The veld fire was burning in the Van Stadens Wildflower Reserve and the picture was taken as we were driving over the Van Stadens River Bridge going towards Port Elizabeth. The organ in the Feather Market building was originally meant to be housed in the Town Hall. A fund was set up for such an organ through income derived from concerts and the hiring out of the Town Hall. In 1882, Norman Brothers, and Beard of Norwich, built an organ specially for the Kimberly exhibition. This was the biggest and most powerful instrument heard in South Africa at this time. The organ was offered for sale at the Kimberly exhibition. 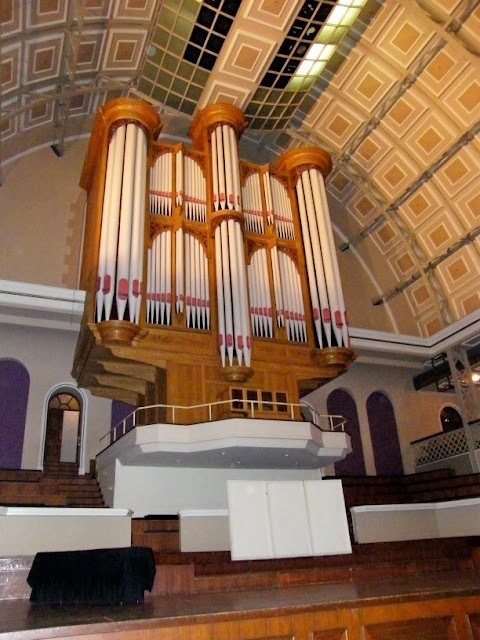 Mr Benson, who was spokesperson for the builders of the organ in South Africa, advised the Council on this purchase for the Town Hall. Mr Benson found the Town Hall too small, but the Feather Market Hall big enough to house the organ. The organ was first played on the 15th of June 1893. Roger Ascham, the municipal organist, gave more that 1 000 concerts on this organ between 1895 and his death on the 31st of March 1934. I got the above information here. This is a follow-up picture of Wednesday's Car ship post. 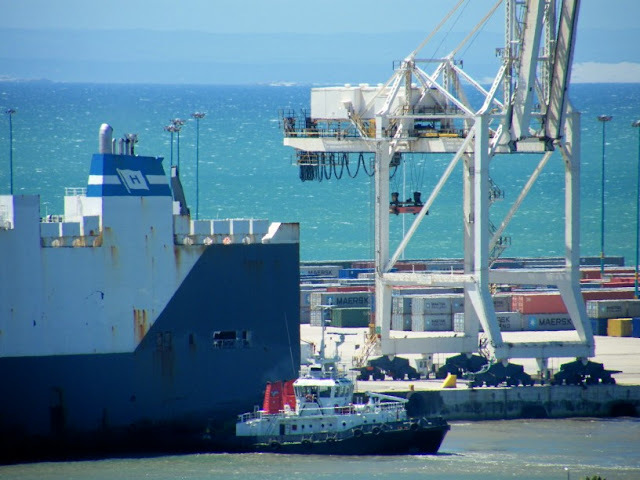 It shows one of the Port Elizabeth Harbour tugs pushing the ship into place at the quay. A couple of kids from the neighborhood has developed themselves a bit of an informal bmx jump area on a piece of open ground next to the railway line close to us. 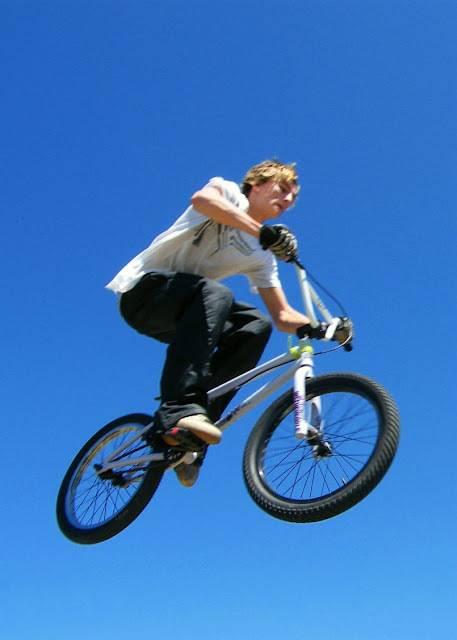 Although some of the older people in the area are complaining about it, the kids are thoroughly enjoying themselves showing off the bmx jumping skills. I stopped to check it out the other day and even though I only had a couple of minutes I managed to get some pics of them flying through the air. For this one I was lying flat on the ground hoping the the dude doesn't loose control and come crashing down on me. Next time I'll try and make some more time to get a couple more shots. 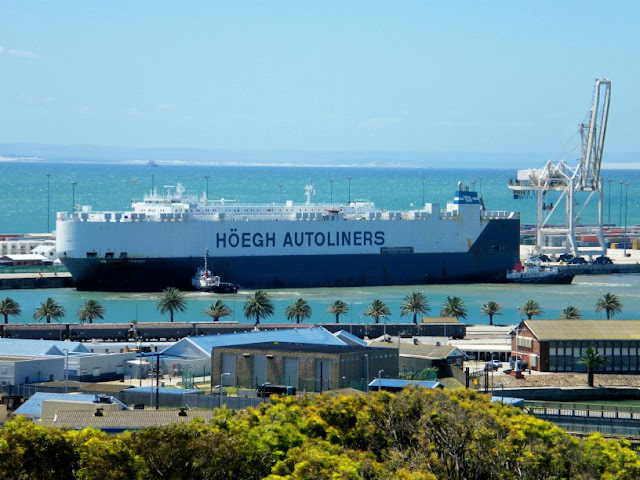 The Port Elizabeth Harbour plays hosts to massive car carriers like this one several times a week. Both General Motors and VW have big export contracts which means that cars manufactured in Port Elizabeth and Uitenhage goes all over the world through the PE harbour. 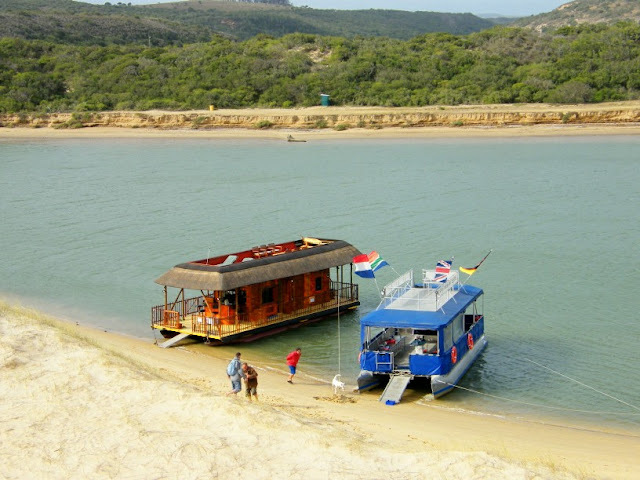 I got to visit the boma at Sundays River Backpackers not to long ago to view the sunset and to enjoy an excellent braai meal after taking a ferry trip down the Sundays River to climb the dunes. 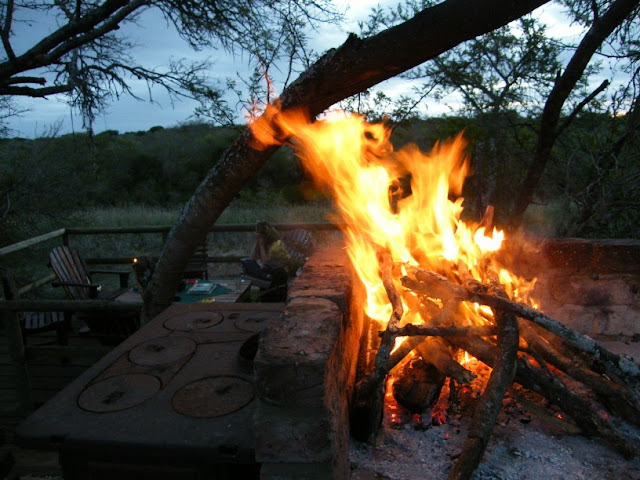 There really is nothing like sitting next to a camp fire in the evening and listening to the evening sounds, chatting to friends and relaxing. Thanks to Bertie and Maggie from Sundays Riviera Houseboats for hosting us. Across the road from the oldest Test cricket stadium in South Africa, St Georges Park, stand the St Georges Preparatory School. This will be the last Sleepy Hollow pics posted for now. A couple of hundred meters up from the camping area the gorge splits in two with the main stream flowing into it from the left hand side. The right hand section is a fairly narrow gorge leading up to a small waterfall. To get to it takes a bit of scrambling over rocks and boulders, but at the top is a peaceful spot. The waterfall may not be the Victoria Falls, but the bit of water trickling down over the rocks makes for a serene atmosphere. At the bottom of the waterfall is a small pool of cool (well actually cold when we were there) water. 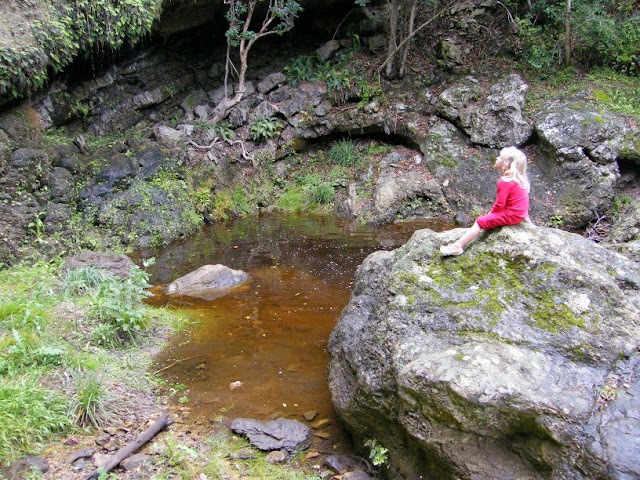 The Maitlands River flows through Sleepy Hollow and part of the property is situated in the Maitlands gorge. This is seen from one of the view points at the top of the gorge. Its hard to believe that this is situated just outside the city limits of Port Elizabeth but still within the Nelson Mandela Bay metropolitan area. 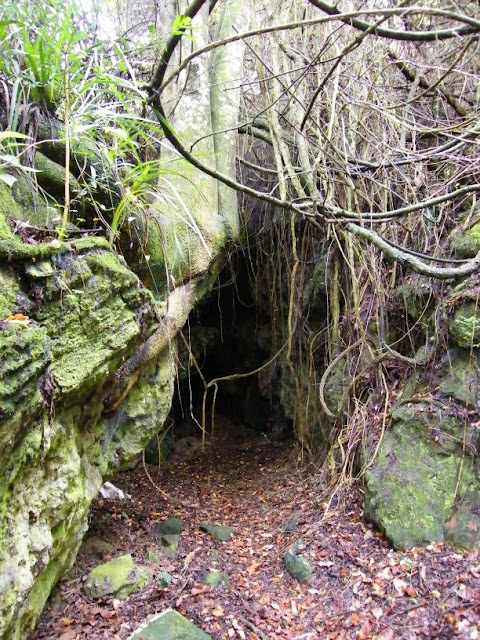 On the western outskirts of Port Elizabeth in the Maitlands area are several old abandoned silver and lead mines that date back to the late 1700's. Personally I know of two places that has some of the old mines on their properties. The one is Maitlands Mines and the other one Sleepy Hollow. We camped at Sleepy Hollow two weeks ago and had a wonderful time. 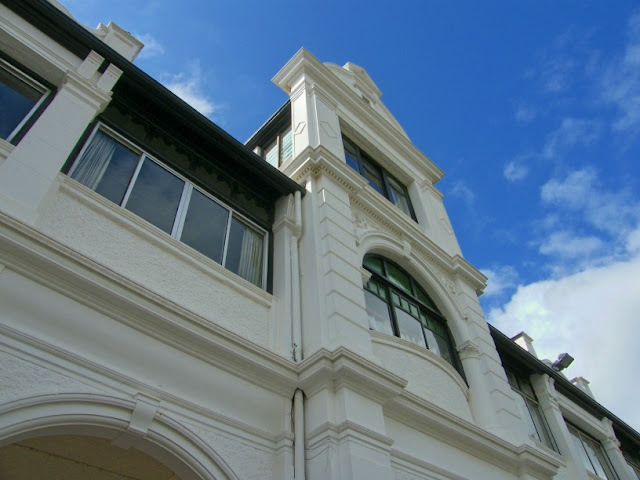 (Read more about our visit here). At Sleepy Hollow there are three of these old mine shafts that goes straight into the hill side. One actually goes in quite far and visitors may explore these mines at own risk, but obviously you need a torch. This is the entrance to Mine 1 at Sleepy Hollow. I thought it had a very spooky look and reminded me of The Brothers Grimm movie with Matt Damon and Heath Ledger. I week or so ago I posted two pics on The Firefly Photo Files taken before and just after sunrise at the lighthouse at Cape Recife Nature Reserve here in Port Elizabeth. This one was taken between the the other two pics. For more of the most awesome photos from all over the world featuring the sky in some way, visit Skywatch. 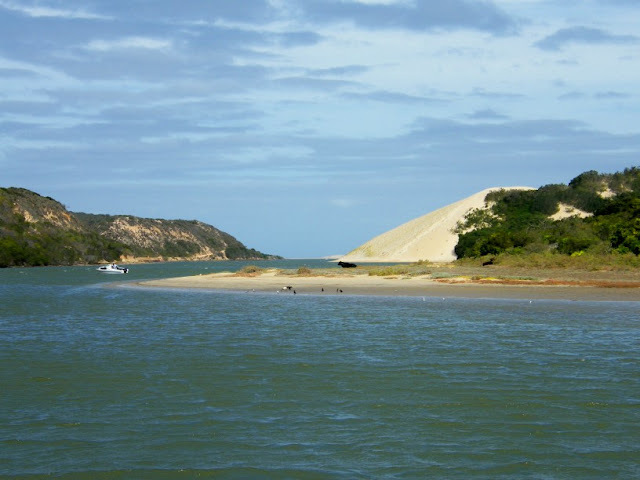 Following on yesterday's post on the Sundays River and Ferries from the previous day, I decided to post another pic of the river, but this time showing more of the dunes. I have done a post on the dunes before, so if you would like to know more about the dunes at Sundays River Mouth, visit my Colchester Dune Field post. 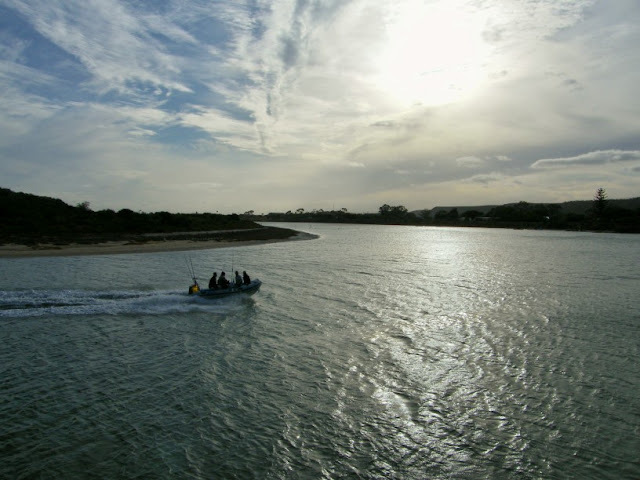 The Sundays River is the Eastern boundary of the Nelson Mandela Bay metropolitan area and situated right next to the Addo Elephant national Park's southern boundary. The Khoisan people originally named this river Nukakamma (Grassy Water) because the river's banks are always green and grassy despite the arid terrain that it runs through. 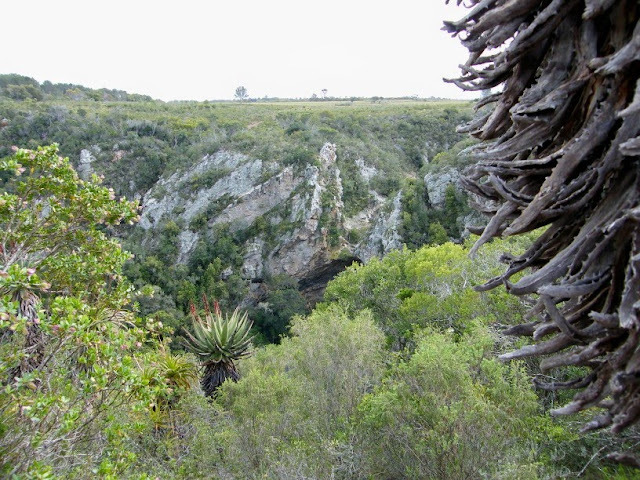 The source of the 250 kilometre long Sundays River is in the Compassberg Mountains near Nieu-Bethesda. 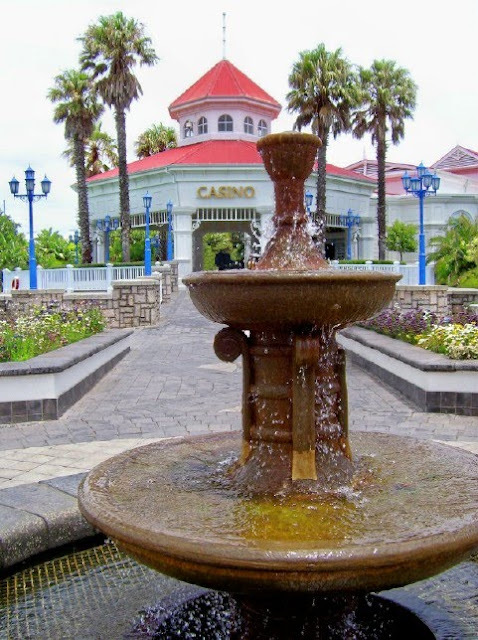 The river then flows in a general south-south-easterly direction, passing the town Graaff-Reinet in the Karoo before winding its way through the Zuurberg Mountains and then past Kirkwood and Addo in the fertile Sundays River Valley. 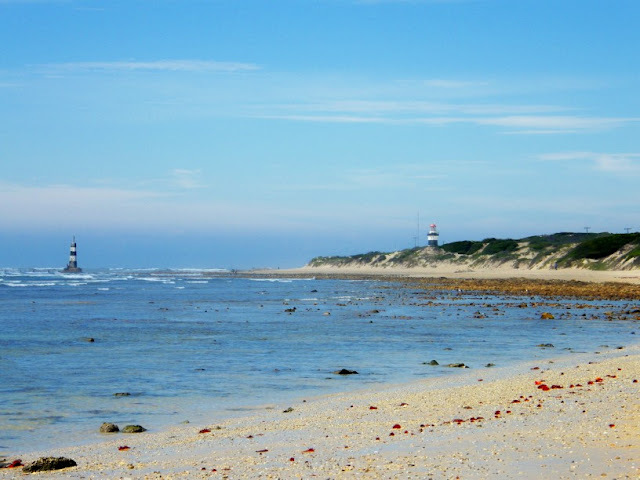 It empties into the Indian Ocean at Algoa Bay after running through the village of Colchester, 40km east of the city of Port Elizabeth. There are two ferries that do trips down the Sundays River at Colchester. The one on the left of the picture is the Maggy May and the one on the right belongs to the Sundays River Ferry Company. 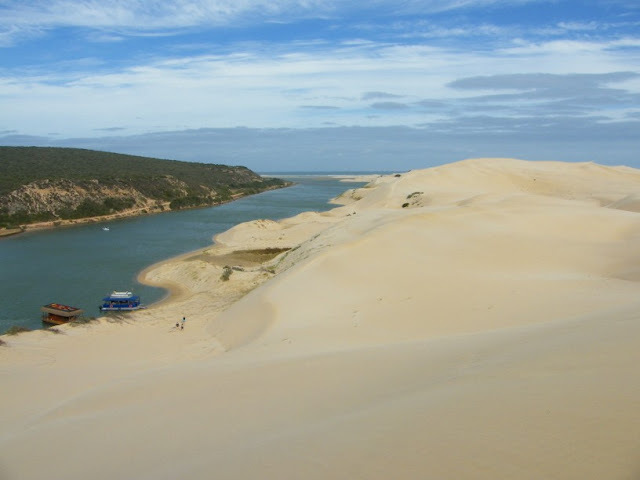 Trips take you from Cannonville up to the old bridge and then down towards the river mouth so that guests can get off and climb the giant sand dunes (forming part of the Alexandria Dune Fields). 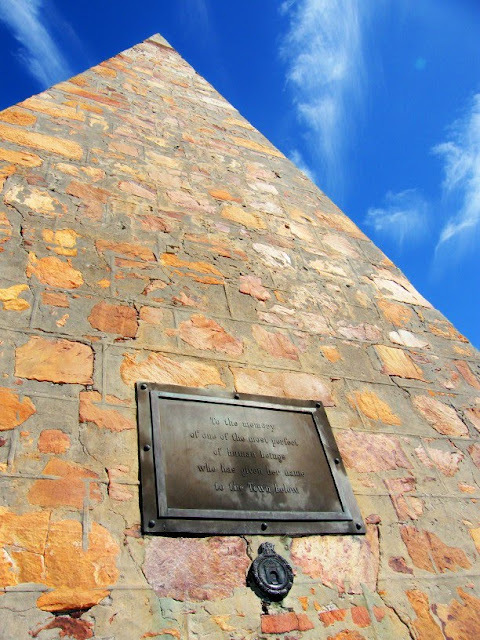 The plaque on the Donkin Memorial (Donkin Pyramid) on the Donkin Reserve. The pyramid was put up as a monument by Sir Rufane Donkin in remembrance of his wife, Lady Elizabeth Donkin. Sir Rufan named Port Elizabeth after his wife on his visit to Algoa Bay in 1820. 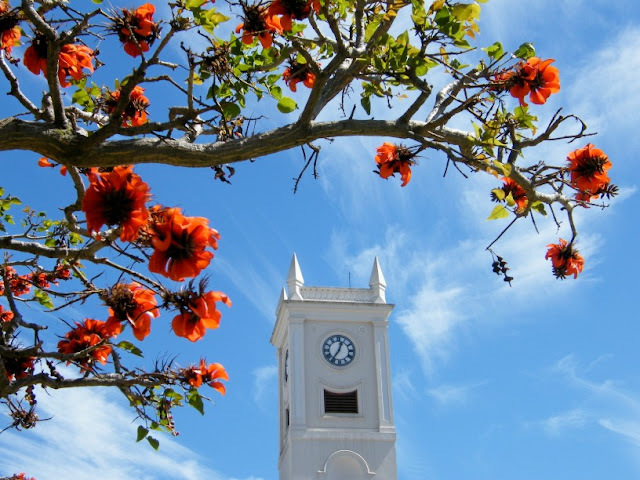 I know I've posted a lot of Cape Recife pictures lately, but it is because I haven't had a lot of pictures of it before and only got to really spend a lot of time there recently. This pic is taken on the beach looking towards he point. The lighthouse can be seen in the centre of the picture while the tower on the right is one of the shipping beacons. 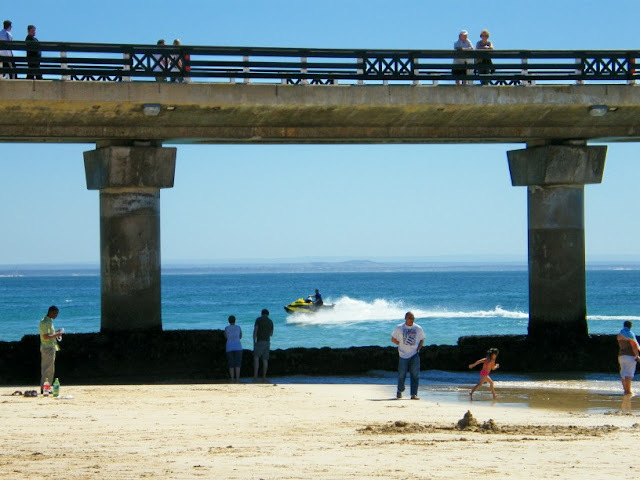 Popping down to Hobie Beach the other day, I noticed how nicely Shark Rock Pier was framing the guy on the jet ski riding the waves on the other side. Looking at the picture afterwards I had to laugh. The picture is perfectly set up in the thirds rule, but the "framed picture" wasn't. LOL. I took this pic on the Donkin Reserve and the idea was to take a photo of the Coral Tree's flowers. When I got to the tree I noticed how nicely the branches framed the Grey Institute's tower, so this is what was born out of the pic. For more super awesome picture featuring the sky from all over the world, visit Skywatch. A couple of fishermen on a rubberduck heading upstream along the Sundays River at Colchester after a day of fishing close to the mouth of the river. I wonder if they got anything? This pic was taken on a trip out with The Sundays River Ferry Company and The Maggie May House Boat. 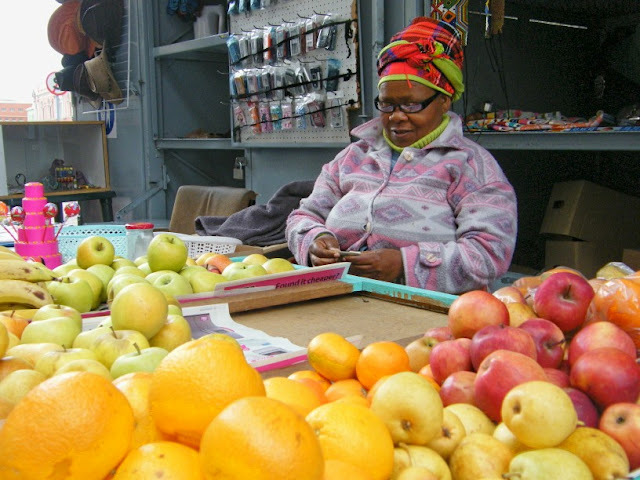 Another one of the street vendors (see Fruit Vendor) from Govan Mbeki Avenue in the city centre. 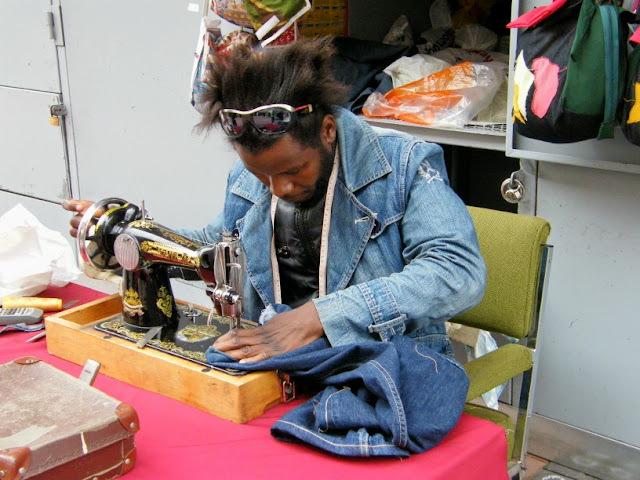 This dude does alterations to clothes and the fact that he is using a antique Singer machine just fascinated me. The sign in front of his table says: King P Fashion Design - Alteration. 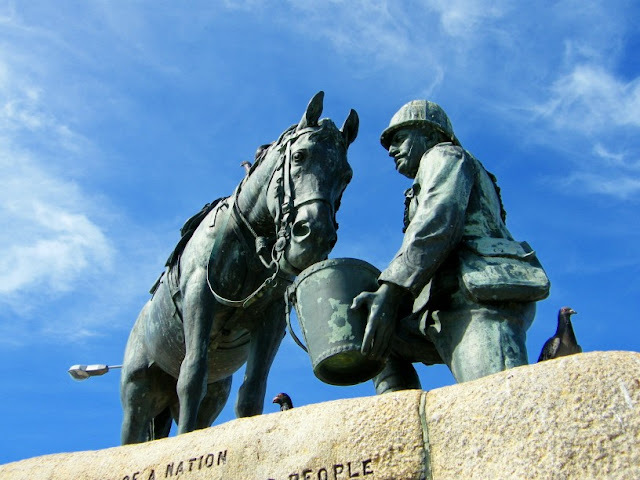 I know this is Port Elizabeth Daily Photo (as in one photo a day), but I couldn't resist placing a second pic just to show where his stall is situated. Right in front of City Hall and Market Square. 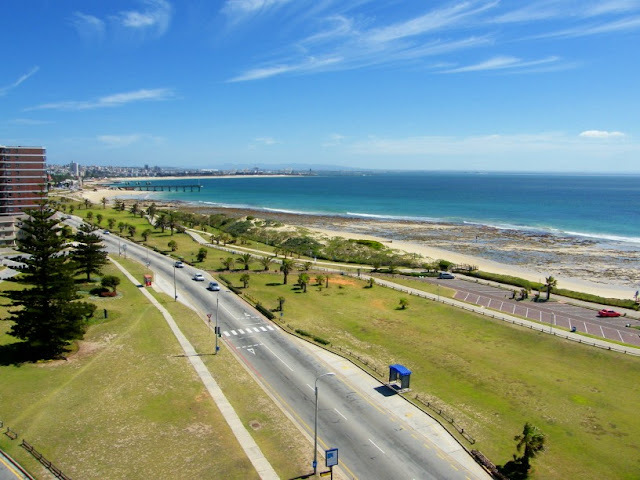 Marine Drive is the road that runs along the coastline from Humewood all the way to Schoenmakerskop. This view of Marine Drive is from the roof of the Marine Hotel and looks back towards town with Hobie Beach in the background. I know I have posted various photos of the Horse Memorial before, but with my last visit there the little gate in the fence surrounding the memorial was open. This gave me the opportunity to get right up to it and take a pic at a different angle to the others that I have taken before. 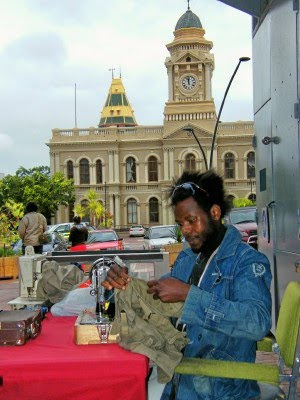 One of the many vendors plying their trade along Govan Mbeki Avenue (Main Street) trying to attract business from the folk who either work in the city centre or move through town towards their place of work elsewhere in Port Elizabeth. 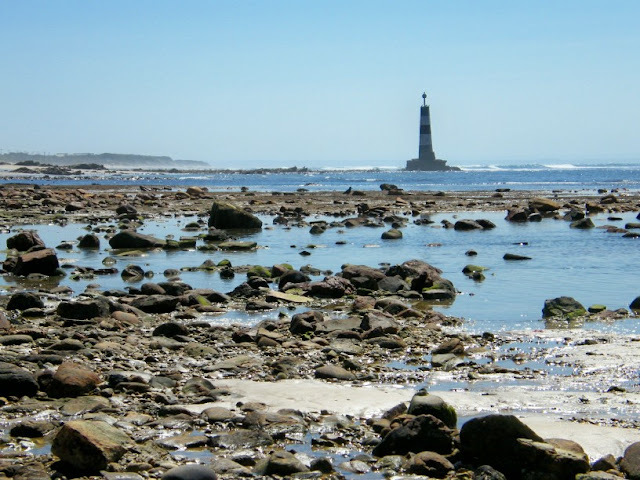 One of the shipping beacons out at Cape Recife. 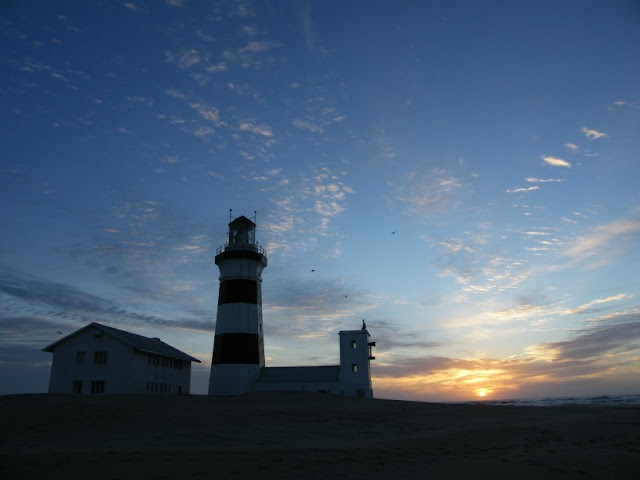 In addition to the lighthouse there are also two beacons that were used in the early days to guide the ships into Algoa Bay before the advent of modern navigational equipment. Ships sailing along the southern coast towards Algoa Bay had to stay on a straight coarse until they lined up the two beacons. Only then was it safe to turn into the Bay and avoid running aground on the treacherous Thunderbolt Reef. Another pic taken from the freeway on the same morning as Monday's harbour sunrise pic. 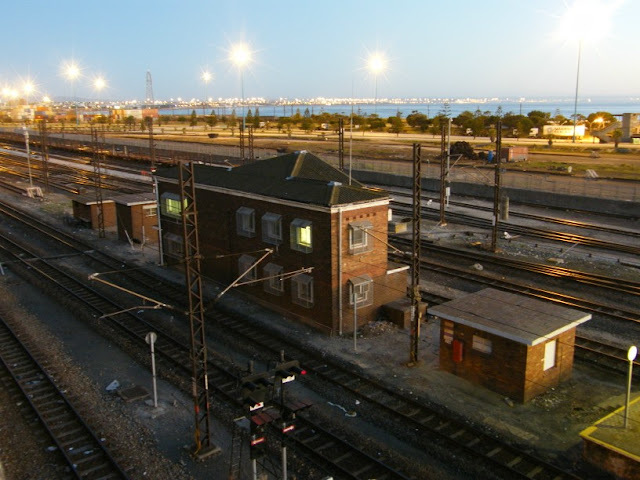 The railway line runs next to the freeway towards the Port Elizabeth Station. This is looking down onto the railway lines with one of the station buildings next to it.